Each person in the party orders $16 worth of sushi, and then you get half price. So, I had an eating buddy with me, so there were two of us. We ordered $16 each, so we had $32 worth of sushi. You with me? Then, it was half price. So, the two of us ended up gorging ourselves on $32 worth of sushi for the mega-low price of….$16! I know I’m not explaining this well, but I hope you catch my drift. Bottom line – it’s half price. I usually stick with the rolls here, which are pretty good. The menu titled “New York POP Creation” has their more inventive stuff – I’m not sure why it’s called POP, but there you have it. We ordered the crunchy crab and mayo (crab stick, fish roe, tempura flake, mayo), golden dragon (eel, avocado, mango), camellia (crab, fish roe, mayo with tuna, salmon), and the spider (fried soft shell crab, avocado, cucumber and fish roe). Everything tasted fresh, the rolls were neatly prepared, and the service was prompt. For $22 (includes tax and tip), my eating buddy and I were fairly stuffed with pretty good sushi. Is there better sushi out there? Surely. Is there a better sushi deal out there? (One that you’ll want to eat, that is). Not that I know of. Half-priced sushi that you’ll want to eat. 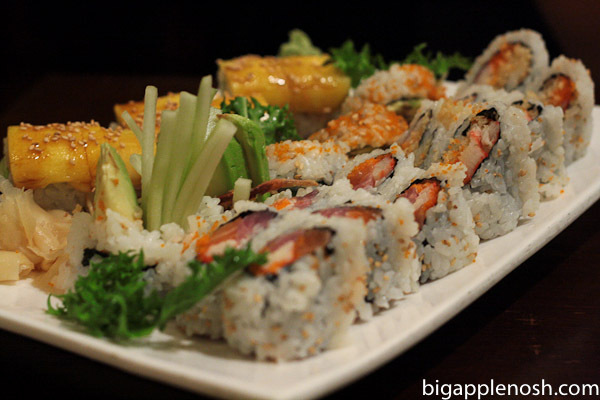 Are you a sushi fan? Why must you kill me with your pictures of yummy food?! I <3 sushi, but gravitate more towards nigiri. But yummmmmy! you explained it very well. So if you dine by yourself and order $16 worth, will i tbe $8 or is it for 2 or more diners? Loves sushi and loves deals, I'd eat that! looks pretty good for half price. We love Sushi. We usually get a cheap sushi fix by going to happy hour. These sushi looks really good. Great to have place that serve cheap and good food! San Jose Love, I don't think there's a dining minimum, so if you can eat $16 worth of sushi by yourself (easy peasy, right?) it will be $8! Sounds like the best two-for-one deal I've heard of yet. I would have to go alone though, no one will ever eat sushi with me! Waah! There's an awesome sushi place near my gym (ruh roh! I have to avoid the gym just so I can avoid spending all my dollars there), but they don't have half price sushi. Tear. 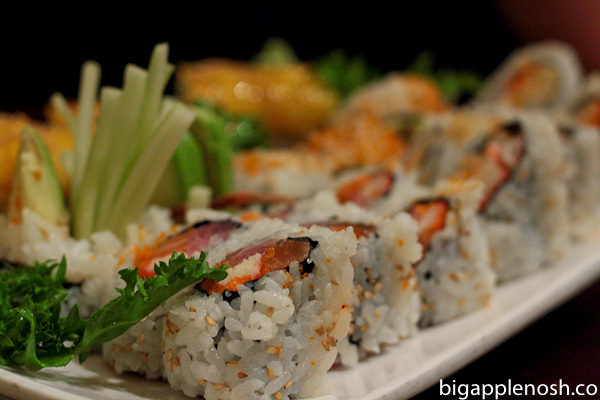 I am a huge sushi fan, but agree with some of the others that the prices can really do you in. Half price sounds like a dream. My favorite sushi place in SF is quite pricey, so I settle for the not-as-good-though-still-yummy option that's closer to my apartment. Sometimes you gotta do what you gotta do! Wow. That sounds like heaven. I would like to say more, but heaven's perfect. And that sounds like heaven. Wow that is a fab deal!